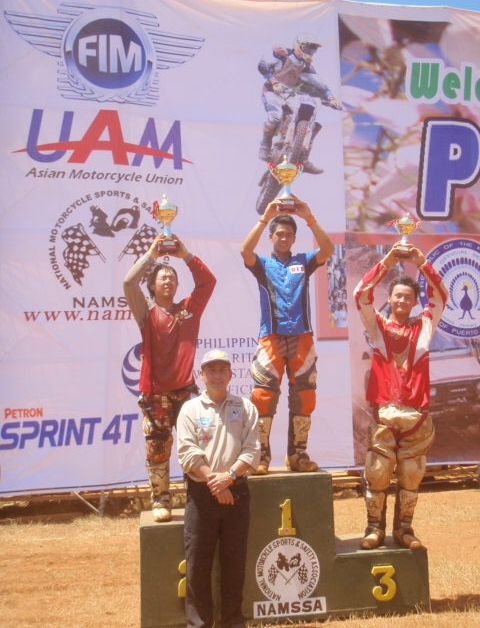 PUERTO PRINCESA CITY – Thai ace rider Thanarat Penjan unveiled a ferocious show of force, pulling a big sweep to capture the crown in the 2009 Motocross Masters of Asia - Puerto Princesa International Motocross Grand Prix at the challenging Sta. Monica International Racetrack here. Living up to his tag, the 19-year-old Penjan was simply unstoppable aboard his Yamaha JAW Thai DID team bike as he controlled the tempo coast-to-coast to claim the coveted silver Mayor Edward S. Hagedorn Cup in this event sanctioned by NAMSSA ( www.namssa.org ) & sponsored by the City of Puerto Princesa, Philippine Charity Sweepstakes, CTI Knee brace, Oakley, Petron Sprint 4T, Castrol, Spyder Helmets , HJC Helmets, Department of Tourism. His feat brought the championship belt back to Thailand after Arnon Theplib won the crown two years back the said event which is part of the festivities for Puerto Princesa’s 137th Foundation anniversary and the 5th Balayong Festival celebrated today, March 4. Even at the start, Thanarat showed he came for nothing but the crown as he topped the qualifying time trials with a time of 1:21.67. And as soon as the green flag was hoisted, the Thai rider quickly pulled away fast from the rest of the 24-man pack to the delight of the 30,000 Puerto Princesa spectators. First turn had a massive pile up with 8 riders going down which included Aep Dadang Indonesian Champ & Iran National Champion Mojtaba. That set the stage for Thanarat’s dominance, winner of the Asian Supercross Championships in Jember Stadium, Indonesia last November 2008, as he gained distance after every lap to secure an unmolested lead at the halfway mark over veteran Japanese champion Shinichi Kaga, whom gave freestyle exhibition in the opening ceremonies and the Asian Motorcycle Sports Academy Coach and reigning titlist Erdenbileg Khaliunbold. Kaga, parading his Suzuki, checked in second while Khaliunbold took third place honors with his Kawasaki. Another Thai Honda entry Kriangkrai Thiannok made it fourth while Iran’s Amirreza Sabetifar ended fifth. RP top bet Kenneth San Andres gave a good fight as he was consistently second in the first few laps of the race but the foreign challenge proved tough as he slipped down to sixth overall. Completing the top 10 finishers were Indoneisa’s Yusuf Irawan and three Filipinos – Ted Conde, former 11-time champion Jolet Jao and young Cebuano ace Jon Eleazar Adlawan. But the Philippines dominated International 12-14 yrs. old Juniors 85cc class via a 1-2-3 finish behind champion Jean Erick Mitra, Renato Mangosong and Patrick North Orbe, beating highly-favored Iranian young ace Hamedrel Adlelgoo. The said event will be beamed to over 600 million viewers worldwide through the ESPN and Star TV in 2 weeks time that will was here to cover the largest ongoing motorsports event in Philippine history now on it’s 5th year. The Asian tour will then proceed to Ulanbaatar - Mongolia, Indonesia, and the final rind to be held in Riyadh, Saudi Arabia on November 2009. For details on the Motocross Masters of Asia, please check out www.namssa.org or www.asiamx.org or call 0917.8479785.